Sometimes I forget I have Skrooge already open and I do it again, and the behaviour when I do that is strange and, in my opinion, wrong because can lead you to think that the data file is somehow corrupted. No toolbar, no pages and no account file apparently. 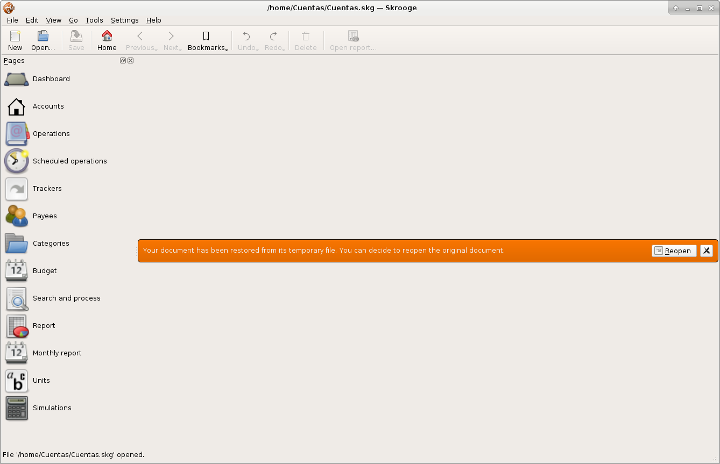 Actually, if you close the two instances (actually three instances since a third one is automatically when you close the first one), and open again Skrooge, your file will be there, berfectly ok. So it is maybe just a cosmetic issue, but it caused me a shock first time a saw it. Could be possible to Skrooge to check if other instance is already running (for same user I assume) and display a warning message? What a coincidence, I just solved this problem. When you say "just" you really mean it, don't you? Because I got the last available sources from git and compiled it just 30 minutes ago and the problem was still there. I will compile it again then. I tested the fix now (sorry, didn't have time before) and it's true that it doesn't open a new instance now, but still the message "Your document has been restored ..." is shown. Is that on purpose? My fist commit was for the panel and sometimes a crash after that, not for the warning. I did a second commit to avoid the warning. Tested! And of course working well, no doubts!